The world is full of digital media, and it is becoming harder and harder to avoid. While there is certainly a time and place for educational television, none of us want it to become the primary source of engagement for our preschoolers. According to new recommendations released by the American Association of Pediatrics in October of 2016, a child between the age of 2 and 5 should watch no more than 1 hour of television a day. So what can you do to fill the rest of your hours together? Here are some ideas, including excellent preschool learning activities, to keep your child entertained without television. Often, the pull toward visual media comes from a sense of boredom or a desire to be entertained. In fact, staying active and involving your child in preschool learning activities throughout the day can help curb that desire to sit in front of a screen. This doesn’t mean you are their cruise director and responsible for keeping your child engrossed every moment! There is a place for quiet downtime without screens or organized activity. But looking into clubs, playgroups, storytimes, or other local activities can add some fun, simple activities to your days. Getting out of doors can make a huge difference in your child’s attitude and engagement in the world around them. If nothing else, there’s no television outside! While park days and picnics are wonderful, even just a simple time coloring on the porch will make a difference. Ask your child what they see, hear, or smell. Describe your favorite parts of the outdoors, and ask your child to do the same. It won’t take long at all for your child to get moving and forget all about their favorite shows for a while. 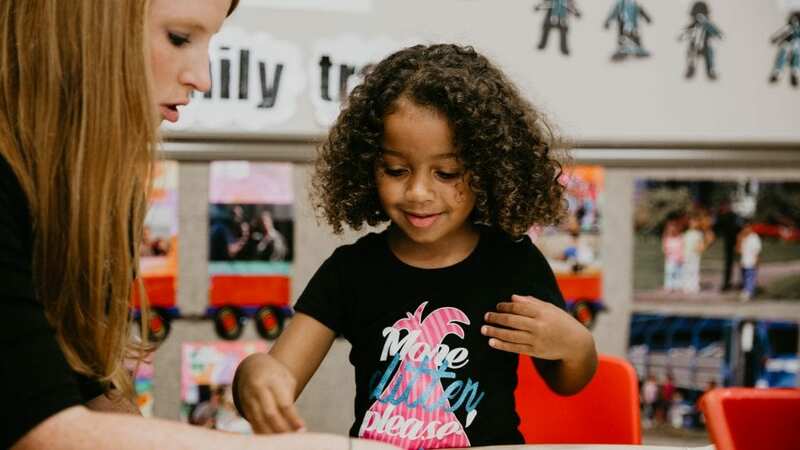 While we love to play with our children, it’s not realistic to think that we will spend every moment of the day participating in specific preschool learning activities. That being said, young children learn an enormous amount of valuable skills just by participating in our daily lives. Bring your child alongside you as you do your daily chores. Talk to them about how you do the laundry, shop for groceries, and prepare meals. There are all sorts of lessons embedded in those daily tasks, and your child will absorb math skills, vocabulary, and strong character traits through your patient explanations. Small children are creatures of habit. They crave routine and find comfort in knowing what will happen next. In the case of television, choosing one day a week or one short time of day for television will help your child understand when it is time for media and when it is not. A phrase like “we watch a show on Fridays” or “we watch television right after your nap” will help a preschooler understand that television is one of many possible activities. It will also lessen the number of times you have to say no, once your child adjusts to the new routine. Preschoolers are typically far less interested in digital media when there are other children to play with. Why not start a weekly playgroup with some friends? It could be in your home, or if you’d prefer you can meet at a local park, library, or indoor play place. Getting children in the same space encourages social skills, creativity, and imaginative play. It also often gives parents the opportunity to relax and enjoy some social time together. Even just having a friend over on occasion can break the monotony of life. Television can be a great tool for teaching preschoolers. And there are excellent programs available on public television to teach letters, numbers, social skills, and more. But ultimately, we as parents want to give our children a wide variety of input and preschool learning activities that will help them grow. It can be difficult not to rely on television to occupy our children. But with a little planning and preparation, you will be amazed at how little you and your child miss screen time.